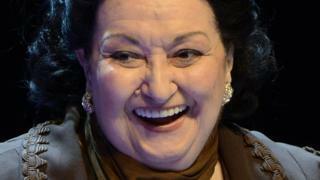 Spanish opera singer Montserrat Caballe has been given a six-month suspended prison sentence for tax fraud. Prosecutors said Caballe failed to pay the Spanish treasury 508,468 euros (£368,409) in tax on her earnings. The 82-year-old singer admitted in 2010 that she lived in Spain but was registered as a resident of Andorra for tax purposes. The sentence was the result of an agreement with prosecutors that avoided the need for a trial. Caballe is best-known for Barcelona, her 1987 duet with Queen singer Freddie Mercury, which was a worldwide hit and was played during the 1992 Olympic Games. She will not go to prison because all first convictions resulting in sentences of less than two years are suspended in Spain. The Catalan regional justice department said she was also fined 326,000 euros (£236,263). Prosecutors claim she earned more than two million euros (£1.45m) from a number of recordings and concerts in countries including Spain, Germany, Switzerland, Italy and Russia in 2010. The soprano claimed she was a resident in neighbouring Andorra at the time but it was alleged she was actually living in Spain "with the sole objective of not paying taxes to the Spanish state". According to court documents, Caballe allegedly signed all her concert contracts through a dummy company registered in Andorra and deposited the income in an Andorran bank account with the aim of "ensuring the Treasury did not have knowledge of her income and her true residency in Spain". In a career spanning 50 years, Caballe had stints with the Basel Opera and Bremen Opera before her international breakthrough in 1965 in Lucrezia Borgia at Carnegie Hall in New York.